The woman behind France’s loveliest hotels is now throwing open the doors of her family villa in deep, green Provence for guests to take over as their own. In the foothills of the Lubeon massif I turn off the road onto a rough gravel driveway spearing between neat rows of vines. From a distance, my destination looks like a simple farmhouse surrounded by olive and cypress. But close up, it is far more refined than rustic; it fact, it’s a very handsome house. In the last few decades, no one has shaped the French hotel scene like Jocelyne Sibuet. Since bringing glamour back to out-of-favour Megève when she opened the game-changing Fermes de Marie almost 30 years ago, the interior designer has created some of the most beautiful properties in her home country — or indeed anywhere. She’s utterly original, eschewing anything we think of as on-trend to zone in on each hotel’s unique location for inspiration. So it’s pretty Provençal farmhouses in the South of France, cozy chalets in the Alps, a colonial plantation pile in St Barth’s. When she unveils a new one, heads turn. And now for the first time, the author of A French Country Home is offering her own villa to guests for a month or two each year. ‘No more than that,’ she insists. ‘This isn’t about renting, it’s about keeping the house alive. I hate to see it closed up when I’m not here.’ There are more than a dozen hotels in her portfolio, which means she is inevitably spending less time in her three houses: a Megève chalet, a Paris apartment and this weekend retreat just an hour and a half from Marseilles. She and her ex-husband gutted Jean-Louis gutted the property but kept the bones, made of a local white limestone, pierre de Ménerbes. Some walls showcase this, others are plastered and painted shades of cream. She split the house because it was too big for their family. One half is the five-bedroom Villa Grenache, which has always been rented out (you might hear the occasional squeal of delight from its pool). The other half they kept for themselves — until now. When the weather is fair, she spends all her time on the pretty-as-a-picture terrace where there are two wrought-iron tables and chairs dressed with pink linen cushions. ‘This table has sun at breakfast, this one does not,’ she says. ‘So it depends how hot it is when you get up, which one you use.’ Nice problems. Beyond the terrace is an ivy-clad walled courtyard. The pool, at the far end, is fed by two burbling pipes. There are spiky yucca, oleander, heady jasmine and valerian, and a glorious climbing rose; on the other side of the wall are 23 acres of vines producing a very good Domaine De Marie red and rosé, Sibuet’s own label. Inside the house, the sitting room is a long narrow space with a gathering of seamlessly mixed-and-matched furniture from travels to Tunisia, India and Indonesia, as well as gilded baroque and rattan chairs collected at antique markets in Avignon and Montpellier. 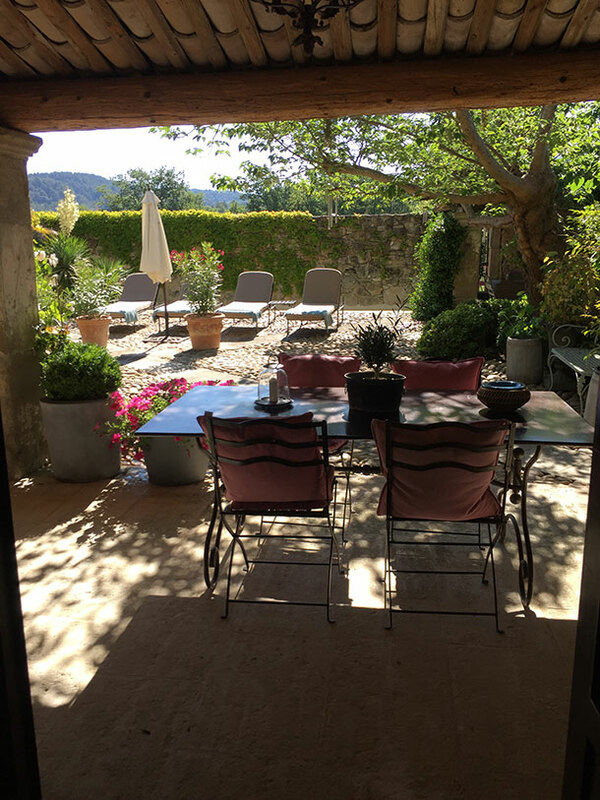 Sibuet sourced doors, ironwork, window frames, a vintage bamboo desk and an oversized radassier chair, a Provençal classic, as she toured the region. ‘I love this picture,’ she tells me, pointing above the formidable stone fireplace where there is a textured collage by local artist Hervé Thibault. Other walls are framed figurative studies and line drawings. Upstairs are just two bedrooms and bathrooms, snugly located opposite each other. One is very much Sibuet’s own, with framed photographs of her children dotted around. Now grown up, Marie and Nicolas are the next generation of family hoteliers who are pioneering younger, hipper, more affordable hotels in the French Alps; their most recent opening was the Terminal Neige Refuge Montenvers in Chamonix this summer. The chicken coop-turned-dining room comes alive when she is entertaining. There is tableware for every occasion and guests can use whatever they like, from antique blue-and-white floral plates to locally bought contemporary midnight-blue crockery bought locally and with a handcrafted wobble. She loves to ‘make a table’, as she puts it. This is a woman who changes the curtains in her Megève home between seasons: bright wool in winter; fresh linens in summer.